In the last three years, I’ve lived in a sorority house in Indiana, a rented room on Northwestern University’s campus, a dream of a first apartment in Chicago, and countless hotel rooms and Airbnbs. Needless to say, I’ve packed and unpacked more times than I can count, and I’ve gotten better at the art of packing than I care to admit. 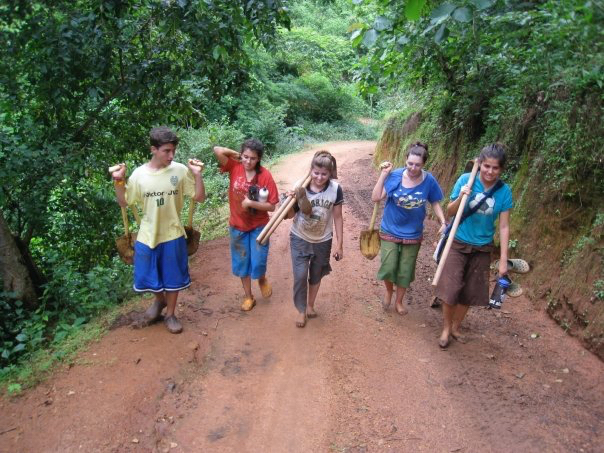 Lena, second from the left, and other students from her Rustic program after a day of service in Thailand in 2009. I’ve gradually stripped my life down to my favorite things, but every time I move, I find one or two things I’d forgotten about that I’m relieved weren’t swept up and thrown away the last time I boxed everything up. This last time it was a journal I kept in July 2009 on my second Rustic Pathways program, Come With Nothing Go Home Rich in Thailand. How I didn’t accidently throw away this ratty, brown book with a pile of old papers and notebooks is a mystery, but I’m so glad I didn’t. Rereading my detailed descriptions of our meals, how nervous I was the first time I used a squat toilet, the time everyone in my group bought crocs, the stories our local leaders told us that I later wrote down about the history of Buddhism all take me back to Thailand—memories you can’t capture in a photo. Memories I thought had disappeared in the haze of college applications and senior year milestones that awaited me when I got back from my program suddenly flooded back, all from re-reading my perception of those moments in my own words. I’m an avid journal keeper and huge believer in the power of writing, but there’s something specific about recording the details of significant, finite periods of our lives that we can later look back on and take in all at once. I’m so grateful to my 2009 self for taking the time to write down all these little moments, even when I was exhausted after a long day of service. Reading this is like watching a mental highlight reel of one of the best, most transformative times of my life. By investing time and energy into creating a time capsule through journaling, I’m able to relive my adventure as often as I want. You should do the same. You’ll be glad you did. Want to put your journaling skills to the test? There’s still time to enroll in a Rustic summer program! If you have any questions about how to choose a program, request a call from one of our global travel experts. In 2008 and 2009, Lena was a student with Rustic Pathways, which widened her understanding of the world and fueled her interest in global service and impact. This continued at Indiana University where she became active in student philanthropy and fundraising endeavors. She also studied abroad In Sevilla, Spain. Lena worked in fundraising and donor relations at Northwestern University before returning to Rustic Pathways for two years as a member of Team Fiji.